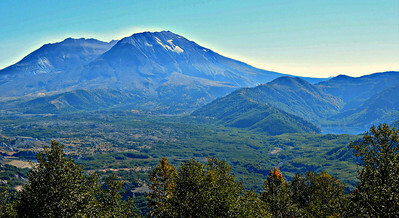 Heading south, Mount St. Helens was sort of on the way, so we wanted to at least take a day to visit. 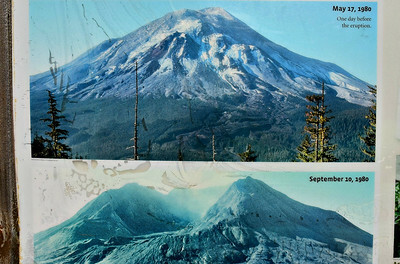 I was finishing up my Junior year in high school when St. Helens exploded on May 18, 1980. Linda was finishing up her Sophomore year. About a year later, we got together. So, being in Kentucky and in high school at the time, we had no concept of this event. I just remember it happening and seeing images on TV, noting that it didn't expel the molten lava of other volcanoes I'd learned about to that point. I actually made a model in school one year of Mount Vesuvius and the destruction of Pompeii. Having just returned from Iceland where there are over 50 active volcanoes and a couple of recent eruptions, visiting our own famous volcano seemed like something we needed to do. 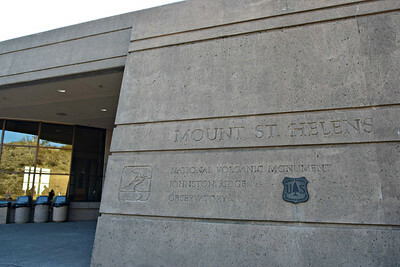 Originally, I thought about spending a couple of nights in the area, but we ultimately decided to get an early start and make it a day trip to visit the information centers and view the mountain. 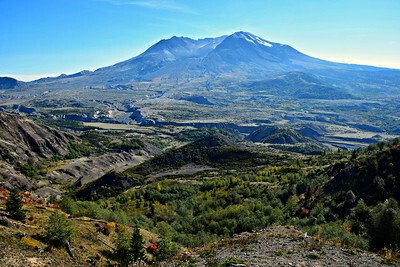 We left Alder Lake Park at 9:00 a.m. (early for us) and made the 75-mile trip to the Mount St. Helens Visitor Center on Hwy 504 run by the state of Washington. It's six miles from I-5 and right across the road from Seaquest State Park. There is a pedestrian tunnel under the road that connects the two. 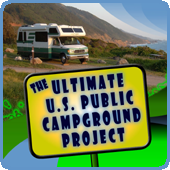 They have lots of RV parking, so we planned to unhitch the Jeep and leave the motorhome there while we drove the other 4o-something miles to the Johnston Ridge Observatory. But first, we went inside, paid our $5/person fee and watched the movie they have on the eruption. It's hard to believe it was 38 years ago. We certainly learned a good deal from the movie and walking through the center. Was it worth $10? Close call, but I'd say yes, especially since they allowed us to park our rig there for a few hours. but the mountain is in view quite a bit of the way and there are several places to stop. 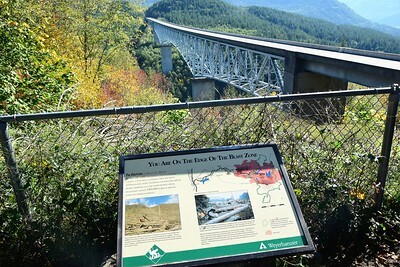 This viewpoint overlooks the bridge that was built and there are informational signs showing we were on the edge of the blast zone 14 miles from the volcano. 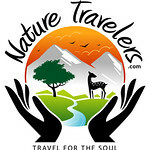 It is a partnership between Weyerhaeuser Company, Washington State Department of Transportation and the Rocky Mountain Elk Foundation. 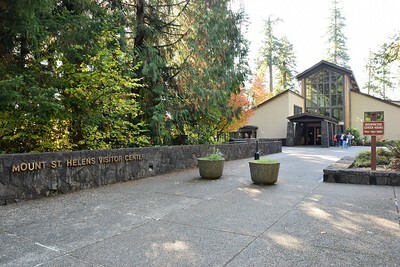 The Visitor Center is open to the public free of charge. We were anxious to get closer to the mountain, so we didn't go inside, but I took a couple of quick photos from one of the viewpoints before we continued on. 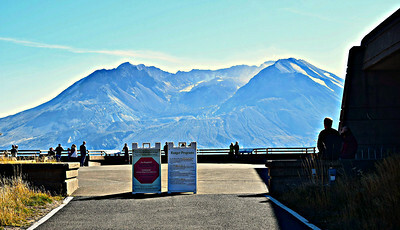 It was a blue sky day, but the sun position in relation to the mountain viewing areas and a light haze made for tough lighting for pictures. 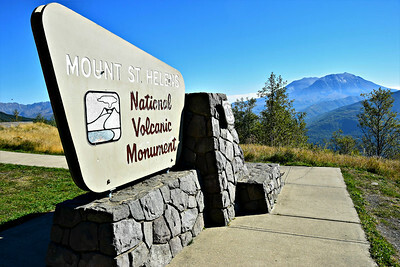 A few miles later we stopped at the Elk Rock overlook marking the boundary for the Mount St. Helens National Volcanic Monument. Not far from there was the Castle Lake overlook. 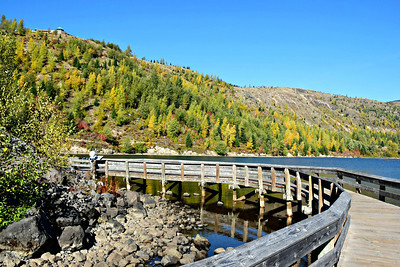 Castle Lake is one of two natural lakes created after the 1980 eruption as debris created natural dams on the creeks flowing into those basins. 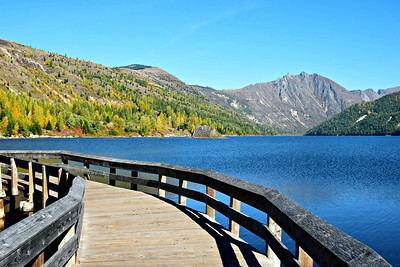 The other is Coldwater Lake, our next stop. 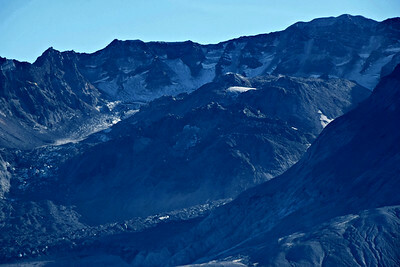 We turned right off the main road toward the lake and Johnston Ridge. Going straight would lead you to the Science & Learning Center on a ridge above the lake. You can park at the edge of the lake in the Coldwater Lake Recreation Area. There is a short paved trail with decks and boardwalks on the lake. In the photo below, you can see the Science & Learning Center perched above in the top left corner. 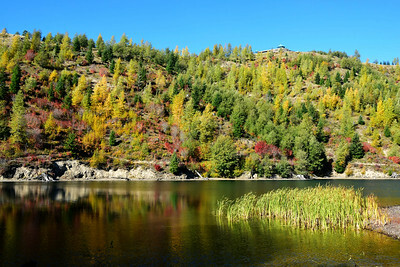 It's a beautiful lake and there were some nice fall colors. 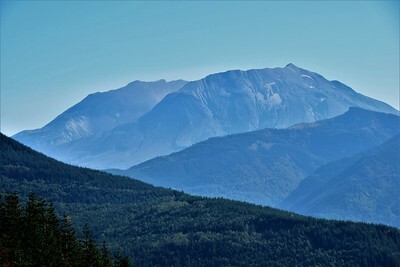 We could see the top of Mount St. Helens from the boardwalks. 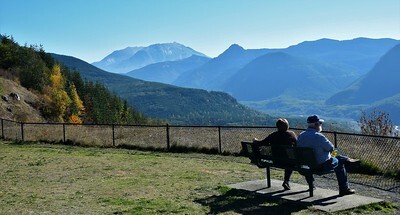 After spending several minutes in the quiet beauty of Coldwater Lake, we continued on up to Johnston Ridge making a stop at the Loowit Viewpoint a mile before the end of the road. That's a really nice viewpoint with a good look at the valley and stream canyons. 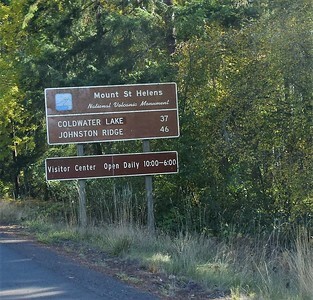 At the end of the road is the Johnston Ridge Observatory 52 miles east of I-5. We walked up from the parking lot to this view. The Observatory is much like a visitors center you would find at a National Park, but they charge an $8 per person fee to go in. Of course, if you have an America The Beautiful Annual Parks Pass, Senior Pass, or Access Pass, you get in for free. We presented our Annual Pass and hustled to catch the movie that was just beginning in their really nice theater. We enjoyed the presentation and were glad it was different that the movie at the first visitors center this morning. A few minutes later, we went back in and watched another movie focused more on the geology. The movies and eye-witness accounts of survivors on the walls were very interesting. Outside, we took more photos of the mountain including a zoomed shot of the lave dome that has grown inside the crater since the 1980 eruption. These views are looking south, and the upper collar of the crater is on the south side and blocks the sun from that edge of the crater. Because of that, years of snow fall that never melted has compacted creating Crater Glacier one of the youngest glaciers in the world. 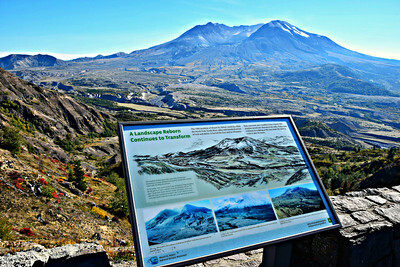 Just outside the visitors center is this comparative sign showing Mount St. Helens before and after the 1980 event. A 5.1 magnitude earthquake led to the side of the mountain collapsing in one of the biggest landslides in recorded history. When that happened, the pressure building up underground exploded in a massive blast. Amateur photographer Gary Rosenquist snapped several consecutive photos from 10 miles away and when they are placed back to back creating a video, it's one of the most amazing things you will ever see. It was a day well spent getting an education about this catastrophic event. Eventually, we made the hour long drive back to our motorhome. We hitched up the Jeep and headed back toward the interstate. On our left we spotted a large parking lot that I had seen listed on FreeCampsites.net. There were some trucks and a couple of RVs parked there, and it looked like some of the locals used it as an unofficial "park and ride". It was clearly a large commercial lot that was for sale, but noting others had parked there, we took a chance. It's not the type of place we would normally park, but we felt better when a couple more RVs pulled in later. Plus we had a really good 4G signal, so we got some things done. Well, a semi came in and hooked up a trailer next to us at 1:00 a.m. and it certainly wasn't the quietest place leading to a rough night's sleep. But it felt somewhat safe and no one bothered us. You just never know about these places which is why we rarely take the risk, but it turned out okay. Moving on to a Harvest Host location tomorrow. Wasn’t it an awesome sight when the movie ended with the raising of the blind, to that amazing view of the mountain? Barb, Unfortunately, the screen wasn't retracting whne we were there, so when the curtains opened much of the effect was lost. But it would have been very cool if the screen had gone up too. Great pics! We were camping out in the boonies on Vancouver Island and heard a very loud boom. 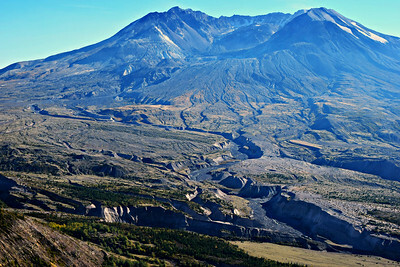 We had no idea it was Mount St. Helens until we got back home to Victoria. Volcanic ash still floating in the air!